Obesity poses an extra anesthetic risk because standard drug doses are formulated based on LEAN body mass. It is difficult to estimate lean body mass when the lean body is wrapped up in a fat suit! Furthermore, anesthesia inherently reduces respiratory function and adding a constrictive jacket of fat only serves to make proper air exchange more challenging. If major abdominal surgery is required, fat within the abdomen makes it more difficult for the surgeon to visualize the normal structures, and the organs become a lot more slippery. 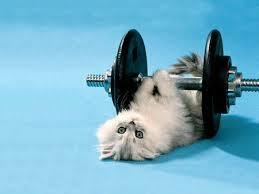 Having your pet in the best physical condition especially as they age, reduces their risk factors considerably. Even a low grade dental procedure can become more risky in an obese pet.